How successful do you want your carp fishing holiday to be? From my experience during the last ten years here about one kilo of boilees a day plus an amount of carp pellet seems to be the average for good catches.Think about it you are spreading it between 3 rods daily over a 24 hour period thats not many boilees per rod, how many carp do you want to catch? Do you want to maximise your chances? In our experience those who use more catch more. Another important factor in your success is choice of bait, there is a big danger in thinking the carp must get used to that mainline bait going in all the time so I will use something different “my favourite syndicate bait for example” whilst I can understand your reasoning to come to that conclusion I can also tell you its wrong! Shock! Horror! What do mean Wrong? Think a little more deeply about the subject, why does your highly cherished syndicate bait work so well? why are most anglers on your syndicate using the same bait? because it works. Why does it work? because with so much of it going in its a constant pre’baiting campaign and the carp come to recognise it as a staple diet food and when hungry go looking for it! and sometimes when not hungry but close by some on the lake bed it will illicit a feeding response (a bit like you taking a biscuit just because they are there not because you are hungry) Most creatures are creatures of habit, take your local firm of builders that visit the cafe every day chances are they are having the full english breakfast more or less the same every day, on what day do you think they say “lets go to the local Bistro for grub today” this is the same throughout the animal kingdom. In more than ten years of running this fishery I have seen many hundreds of carp anglers bring different baits with them, have they caught carp? yes many of them (although some each year are a total failure and I cannot name them for legal reasons) have they out fished the mainline baits? a definite No they have not! a fact to which our catch reports that you complete while here testifies. Mainline bait is good quality its been used here for over ten years and the fact is it is very very effective and it works well. Would other baits equal ever equal the catch rates of the Mainline baits? look there are many good quality baits on the market today and if we changed to one of those after many many weeks of feeding them with little else to compete with the carp would switch over to them undoubtedly and they would then fish as well as the Mainline bait does now, but here’s the point you don’t have many weeks you have seven days for your carp fishing holiday. So the choice is yours, we only want you to catch carp and want to help you maximise your chances. Another big mistake I have seen anglers make with bait choice is purchasing so called Mainline bait from bait rolling companies, they may call it mainline cell or Active8 it may look and smell similar but when you compare with a genuine one you see the difference, it is not the same therefore nor is the carps response to it. In this world you get what you pay for in and if it is cheaper it is cheaper for a reason, it might smell the same to your senses but different ingredients means it acts differently on the lake bed and the carp are sensitive to that change hence they don’t bother with it and go find what they know, after all elsewhere on the lake someone is baiting up with what they are looking for. Remember its cheap for a reason (the cheap ingredients they use) my suggestion if money is a bit tight would be to use half the quantity of genuine mainline bait rather than double the quality of a poor product, that would increase the chances of your catch rate. Another thing I hear frequently “I am a bait tester for …..” Look the bait you are testing is not some miracle catch all bait and I have seen so many failures for bait testing especially given the reasons listed above and most bait testers are really just using the title as means of getting cheaper bait. Don’t waste your holiday testing for someone else (great for them to know its a failure but not for you!) use your time to concentrate on some of the finer points of carp fishing along with the bait the carp are searching for to maximise your success. Am I sounding like a rep for Mainline? haha Those who know me know I speak as I find and these are my honest findings after ten years. Ultimately the choice is yours to make but please remember we want you to catch carp not just dream about it. If you have never used mainline baits before you only have to look at the catch reports in carp magazines to see how effective they are. 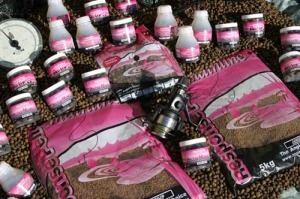 Many of the UK’s top carp anglers use nothing else. Because we use a lot of it here, the carp regard it as a part of their natural diet, its ingredients are part of a good staple food diet for the carp. It is not one of those short term baits that catch for a while then stop working; it continues to produce through both the summer and the winter months. We stock ( subject to availability) Cell, Active8 and New Grange frozen boilees along with popups and dips. Also stocked is a 9mm carp pellet this works very well as an attractor to induce carp to start feeding . During the winter we feed a rich, balanced diet carp pellet that is specially formulated for carp. It is produced by one of Europe’s leading animal food producers and is based on scientific studies of carp diets. It would be easy to use a cheaper pellet or trout pellets but we want our carp to have the best. This helps to ensure that you are catching carp in top health and in pristine condition. Fishing boilees over a bed of this pellet is a very successful method here. In order to provide you with the best baits available we have to drive all the way to the UK and collect fresh baits direct from the Mainline factory and freeze them when we arrive back in France this involves a 1000 mile drive all together a 3 day trip but it is worth it because our carp love it! I have observed many anglers tipping a pot of dip, hook bait enhancer over the pellet and freebies that they are about to send out to the carp, think about this. Would you pour a whole bottle of tomato ketchup on your egg and chips? or a whole pot of mustard on your ham sandwich? No? why not? is it because it would become repulsive to you? The bait dip is a hook bait enhancer to entice them to take that “one” amongst the other offerings, like you dipping a chip in your ketchup to enhance the flavour. Remember they are very sensitive to smells and a whole jar of dip could send them swimming away from that section of water because you polluted it with a “whole bath of ketchup”. So bait dips have there place but use sparingly to enhance your chances of catching more carp. You know that sometimes washed out baits work very well, ever wondered why? Ponder a little over that one, think about carp feeding situations the how what and why. Sharks can smell one part blood to one million parts water, interesting?